Baking requires mixing of a number of dry ingredients. In most cases, the flour that comes from the store is compacted in to lumps and may have foreign materials. To be used for baking, such flour must be fine and aerated to mix evenly with other ingredients. The best tool to ensure the flour is perfected for baking is a flour sifter. Two kinds of sifters exist according to style. The first is the traditional crank style flour sifter which comes with a handle. To use it, you will need to hold the handle and turn. This will push the dry flour from the wire mesh screen. The second type uses shaking mechanism to sift flour. Regardless of the style you desire, the simple fact is that you need the best flour sifter you can ever find in the market. Our business is to help you find that flour sifter. 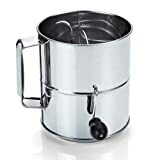 It is easy to understand why Bellamain Stainless Steel 3 Cup Flour Sifter is Amazon’s best seller with near perfect rating. 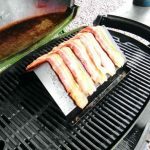 It is strong and lightweight with capability to hold up to 3 cupfuls of flour or other dry ingredients. It has measurements stamped right into the metal and you can easily read from inside the sifter just as you would from outside. The sifter operates via a classic hand crank and single mesh. As you may already know, crank-style sifters are the delight of professionals because they can withstand repeated use and causes minimal strain on their hand. Sifting with this stainless steel flour sifter is effortless and it takes just a few seconds to clean. It cranks smoothly to capture everything without clogging the mesh screens. Unlike many other models that are hard to use by arthritic people, the Bellamain flour sifter is different. Due to its lightweight design and smooth and effortless operation, arthritic people who love baking have nothing to worry about. Stainless steel is easy to clean, nonstick and resistant to corrosion and rust. According to the manufacturer, the sifter will guarantee you up to 20 years of service. This is true value for your money. 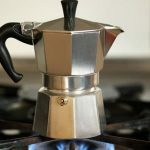 Norpro had arthritic people and those with wrist disorders such as carpal tunnel syndrome when they made their unique battery-operated flour sifter. Unlike the hand-cranked versions, the Norpro Battery Operated Sifter does not leave any mess after use. The mechanism of operation makes it an ideal choice for cooks or baking enthusiasts who have trouble squeezing a sifter or turning a crank. It requires one C battery (not included) to operate. It is made from high quality, lightweight and BPA-free plastic for health and durability. The single mesh screen, on the other hand, is made of stainless steel to last a lifetime. The electronic operation is great but it makes the sifter non-dishwasher safe. This means you have to clean it by hand, something many people struggle to do. In case you have a large family to bake for, the Norpro Battery Operated Sifter will simplify your work due to its large capacity. It can hold up to 5 cups at a time. Since the sifter is operated by battery which is fitted into a fixed compartment, it difficult to remove. One source of concern is the size of screen spaces. Otherwise, the sifter works just fine. Be the talk of your family and friends by preparing for them cakes that are lighter and finer than they have ever had before by using the great Natizo Stainless Steel 3-Cup Flour Sifter. Unlike many models you will find in the market, the Natizo sifter comes with a lid that will stop any flying flour from staining your kitchen floor or creating rings in the cupboard when you are operating the utensil. There is also a bottom lid for the same purpose. To guarantee you a long lasting service, the sifter features stainless steel hand-crank, agitator and wire mesh. It is well known that stainless steel is resilient, long lasting and rust-resistant. Similar to other high quality sifters, the Natizo 3-cup flour sifter features stamped measurements in common units and are visible from both inside and outside the sifter. Featuring a unique, ingenious design, the Wilton 2103-1090 Flour Sifter is a great choice for any serious chef. 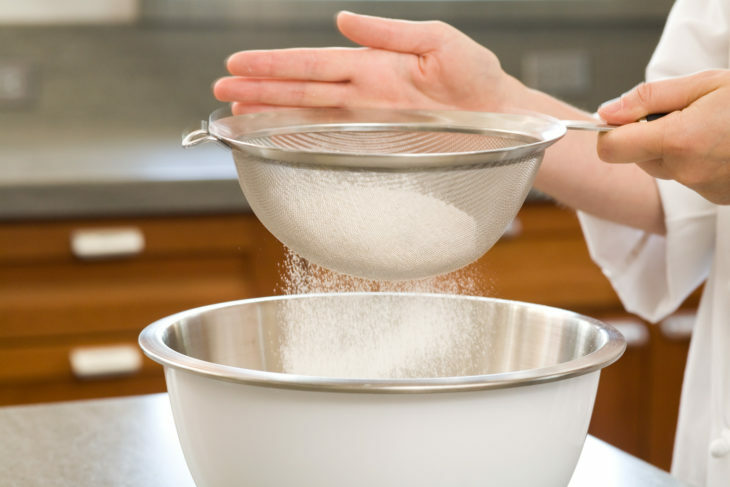 The sifter is ambidextrous meaning you can use it whether you are left-handed or right-handed. The design itself is luxurious and will give your kitchen a contemporary touch should you bring it home. It features an easy turn handle that anyone including those with weak or arthritic wrists can operate without much effort. The sifter is rather small because it can hold just two and half cups of pre-sifted flour making it ideal for smaller families who may not bake much cake. If you buy the Wilton 2103-1090, you will receive the sifter, cover, removable turn handle, comfortable handle as well as non-slip bottom. 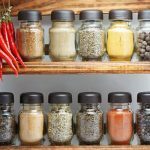 This means you will have everything you need for the sifter to work right out of the box. As mentioned earlier, the design is stylish and innovative. You will hardly find another model that feature transparent BPA-free plastic material in its construction. The body of the sifter is light silver while the cover and handle tip are purple. The color combination is simply beautiful. I believe you will love this hand-cranked flour sifter the moment you set eyes on it. 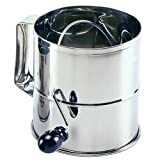 If you are looking for a high capacity flour sifter then your search should end with the Norpro Polished 8-cup Stainless Steel Hand Crank Sifter. 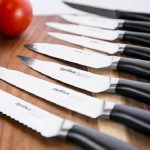 This traditional utensil will make your cooking easier, simpler, delicious and restaurant-grade. It features a classic design with classic hand-cranked operation. The heavy-duty rotary hand crank has a handsome wooden knob that gives it a luxurious touch. The hand-crank is extremely easy and comfortable in hands and that means even arthritic people can use it without a problem. The interior features a medium fine stainless steel wire mesh to provide light, even application over the dough. Besides the great functionality of the wire mesh, its construction material says a lot about the sifter’s durability. Along with the mesh, the entire body features high-quality stainless steel that is rust and corrosion resistant and extremely tough. Although the sifter is machine washable, the manufacturer recommends you wash it by hand to increase its life span which already runs into decades. Well, you may find it a little bit tricky to clean because of the crews inside. However, that should not dampen your spirit as the utensil is optimized for performance. To ensure long service, you will need to clean your flour sifter well and store it when it completely dry. 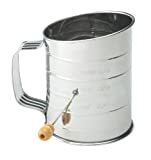 Mrs. Anderson’s Baking Hand Crank Flour Icing Sugar Sifter is doubtlessly one of the best in the industry. It is an incredibly versatile sifter well designed to aerate flour, ice sugar and sift other powdered ingredients. 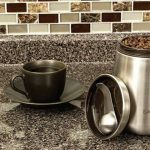 The sifter is constructed with high-grade stainless steel material that is not only durable but resistant to rust and corrosion. The sifter comes with fine wire mesh to process fine ingredients faster and a wooden knob crank handle to rake the ingredients. You can choose from different cup capacities from as little as one cup to as much as 5 cups. The measurements are engraved on the side of the sifter and are visible from inside and outside. This is to ensure you take accurate measurements for high quality baking for even consistency and better taste. Hand cranking is easy with this sifter. Even medically challenged cooks such as arthritic patients can use it effortlessly without worrying about any side effects. Unlike other sophisticated models, this unit is extremely easy to clean. However, manufacturers discourage machine washing. Instead wash it by hand by wiping it down and ensuring it dries thoroughly before storage to ensure long life. The sifter is perfectly crafted to match and improve your interior décor. Presenting a blend of traditional style and modern touch, the Cook N Home 8-Cup Flour Sifter is a must have kitchenware for any serious cook. 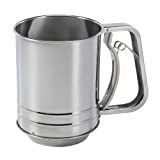 The sifter boast of sturdy stainless steel construction that is lightweight, durable and pleasing to look at. In the interior, a fine stainless steel mesh screen and four wire-agitators make sifting of flour and icing sugar among other powdered ingredients easy breezy. 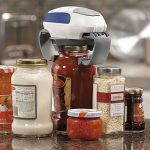 It operates through hand-cranking, a process that is made so easy through a comfortable and ergonomic handle. Cranking the sifter is so easy that even arthritics and other individuals with weak wrists can use it without much of a problem. The large, 8-cup capacity is ideal if you have big family to bake for because it will save you from doing it over and over again. Stainless steel construction is a mark of durability but it also means easy cleaning. All you need to do to maintain the shiny finish is wipe it down with a clean dumpy rag and then dry it properly immediately. Failure to do this may leave some water-streaks especially on the screws inner side of the sifter. For the same reason, the unit is not dishwasher safe. Cuisinart is a global firm known to produce great quality kitchenware and other related products. You will find their CTG-00-SIF one of the best flour sifters currently in the market. The four-cup capacity sifter boasts of strong and durable stainless steel construction with equally strong and efficient stainless steel wire mesh. Weighing just 8 ounces; the sifter is extremely easy to use and handle especially in a busy kitchen. The two fine wire mesh screens ensure all lumps are unwanted materials in flour, sugar and other powdered ingredients are removed for smooth and delicious cakes. The 2-screen design may be ingenious but it presents a problem. Flour or sugar particles that pass through the first screen may not necessarily pass through the second which is a good thing but such residue is very difficult to eliminate. This squeeze style sifter is easy to use but may prove problematic to people with arthritis, carpal tunnel syndrome and other conditions that lead to weak wrists. This makes it different from the majority of flour sifters in our reviews but does not in any way interfere with the sifter’s performance. Made in china, Cuisinart CTG-00-SIF is elegant and will add a splash of luxurious color to your kitchen décor. If you want to win the hearts of your family with delicious dishes, do so with Kitchen Winners Stainless Steel Flour Sifter. 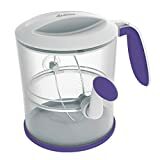 This small 2-1/2 cup flour sifter is ideal for most, if not all, baking applications and will do very well for small families although larger families can also use it but will have to invest a little more time to prepare enough food for everyone. The sifter is optimized for aerating flour and other powdered ingredients before mixing to yield a lighter, fluffier batter for well baked foods. It uses single-hand operation thanks to easy-grip handle as well heavy duty spring. 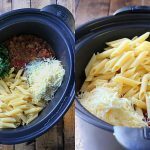 These features make it easy to squeeze meaning anyone can use the sifter without unnecessary strain on the wrist and fingers. Kitchen Winners flour sifter is constructed with lightweight, rust-proof steel for excellent durability and ease of cleaning. In fact, the sifter weighs a paltry 4.8 ounces. However, the unit is not dishwasher safe. You must hand wash it with warm water and mild detergent. After washing, ensure you rinse it thoroughly before storing to eliminate watermarks and thus prevent staining. With that maintenance, you can be sure to use the sifter for decades without replacement. Sometimes you cannot help but wonder how large bakeries make their cakes and other bakes products because they are just so smooth and delicious. Perhaps you could have your answer by buying the Baker’s Secret 3-Cup Stainless Steel flour Sifter. The stainless steel used in its construction is heavy-duty and resistant to rust and extremely lightweight. The sifter weighs just 4.8 ounces and can hold up to 3 cups of sifted powder. The sifter uses simple squeeze technology and features an ingenious handle that is comfortable to hold and soft spring for easy operation. Unlike most squeeze-style flour sifter models that are cumbersome to operate, the Baker’s Secret 3-cup is made to be used by everyone including those with joint problems such as arthritis. It is not dishwasher safe but you can easily clean it with warm, soapy water. You can then rinse and dry it thoroughly before storage. This is the best sifter to go for if you are operating on a tight budget. Its single digit price tag makes it one of the most affordable stainless steel flour sifters currently in the market. Even better is that it comes with limited lifetime warranty to guarantee you unperturbed service for years. Most commonly manufacturers of flour sifters use either heavy-duty plastic or best stainless steel. Other materials such as tin may also be used. Plastic is lightweight, easy to clean, resistant to rust and fairly durable but you have to ensure it is BPA-free and healthy. Stainless steel is great because it is elegant, easy to clean, durable, lightweight and resistant to rust. Tin may be comfortable but non-resistant to rust. The size of the sifter you buy should reflect the size of your family. If you buy a low capacity sifter, it will force you to sift repeatedly to achieve the amount of powdered ingredients you need. A large capacity flour sifter will eliminate such a problem. You can choose from as little 1-cup sifter to as big as 8-cups. The choice is yours to make. The size of holes in mesh screen of the sifter is an important determinant. This is because it determines the fines of the sifted flour, sugar and other dry ingredients. You can choose between fine, medium and large mesh screens depending on your needs. A few models feature two screens for even more efficient sifting. You will have to make a choice based on your personal needs. A kitchen is a focal point in a house and therefore any utensil, kitchen appliance or kitchen fixture must not interfere with the existing décor of the room. In choosing the best flour sifter for you, look for features such as color, shape and overall design whether classic or modern. For instance, if your kitchen décor is traditional then you can go with a classic style sifter and vice versa. Flour sifters are available in three styles in terms of mode of operation. The first style is classic hand-cranked while the other two are squeeze and battery-operated. 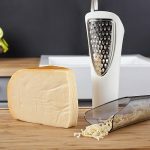 The classic hand-crank operation is extremely common with many brands and they are generally easier to operate and are more efficient than squeeze-style models. Battery operated models may be easy to operate but difficult to maintain. You kitchen is never complete without a flour sifter. However, not just any flour sifter will do. You have to buy one that will give you value for your money. Luckily, most flour sifter models are affordable and can last for several years if used and maintained properly. Our reviews might be mouthful but that’s exactly what you need to make an informed choice. You can now shop with confidence knowing you will get the best flour sifter delivered to you. Nevertheless, we could like to thank you for your time even as you contemplate your next move.